Many of the things that make Japan so wonderful and authentic are also the things that can make it a little difficult for visitors to get around the country. Signs and menus are usually in Japanese, and fluent English speakers are a rare occurrence. For this reason we’ve decided to point you guys in the right direction, so that, when you get to Japan, you’ll know exactly where to go to get your hands on some lovely drams! Today we’ll be talking about Bar Zoetrope, located in Shinjuku, Tokyo. At first sight, the bar and entrance aren’t that spectacular. An elevator takes you up a few floors, and opens up to the bar’s main door. The sign on the door reads “Shot Bar” and instils some last minute doubt, making you wonder if you’ve come to the right place. But don’t worry, it’s the right place. Once inside, depending on the day and time, you may have a hard time finding a seat. The place is quite small, with a bar and four tables. You will be greeted by owner Atsushi Horigami, who will probably be busy running around serving and cleaning. As he runs the place on his own, he gets straight to the point and is usually too busy for chit-chat, offering a very different approach to hospitality than most Japanese establishments. Even his menu cuts to the chase, not in the most polite manner, but very charming in its own way. Once seated you’ll notice a projector showing an old classic film; Mr Horigami has a passion not only for whisky, but for old vintage films too. He even recruited the late Takeo Kimura, who was a legendary art director in the world of Japanese film, to decorate the bar. Many in the Japanese industry define Zoetrope as the best place to drink Japanese whisky in the world. Simple as that. Mr Horigami runs the bar independently, meaning that, unlike the many bars owned by Nikka and Suntory, Zoetrope offers drams by all the Japanese distilleries, including Mars, Chichibu, White Oak, Karuizawa, and Hanyu. There are over 300 whiskies available, as well as almost 100 bottles of other spirits produced in Japan, including Japanese rum, vodka, gin, and shochu. You guessed it, Zoetrope’s main focus is on Japanese alcohol, and Japanese versions of foreign liquors. 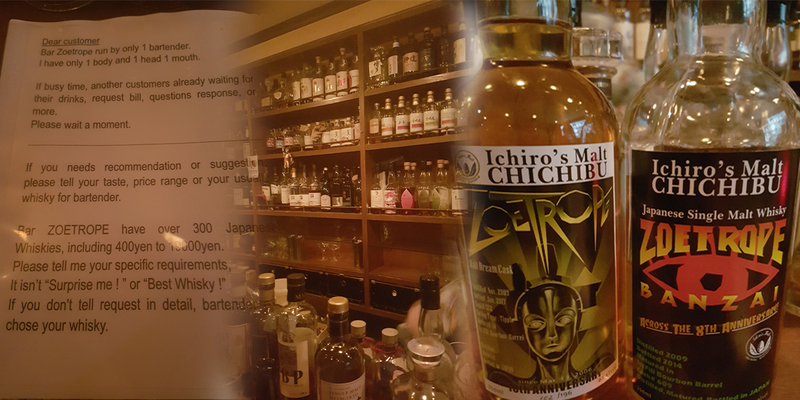 There are some amazing bottles on offer, including some limited Chichibu releases, which were bottled for the bars 8th and 10th anniversaries. Atsushi bought quite a few casks from the distillery, back when they were selling them. Rare Karuizawa and Hanyu drams were on the menu, as well as some bottlings by well-known distilleries that I’d never even heard of. Despite the huge whisky selection, during my time in the bar I realized what makes Zoetrope unique. It is the lack of the obsessive and luxurious edge found in most high-end whisky and cocktail bars around Tokyo. The décor isn’t too fancy or whisky-themed, the bar isn’t full of snobs telling you how to drink your whisky, and the atmosphere is relaxed and inviting. It’s simply all about the whisky, and the movies on the screen, not about your look, your knowledge, or your money. As the bar has grown increasingly popular over the years, the prices of each dram have also followed suit and risen. When compared with other smaller, less-known bars in Tokyo, Zoetrope is rather pricy. However, the bar is a piece of Japanese whisky history, and has one of the biggest selections you will find anywhere in the country. If you’ve got a free night in Tokyo, head on over, and say hi from dekanta!